The 4 x 4 Land Rovers shows you the island from a totally different perspective as they go “off the beaten track” to many of the spectacular spots around the island. Adventure Safari: This expedition will lead you to the eastern and northeastern side of the island. This Safari offers many stops including two on the beach and an opportunity for a swim at lunch. Includes: soft drinks, juice, rum punch and snacks along the way, and lunch with a glass of wine. Time: 8/80:30am to 2:30/3pm Monday to Saturday. 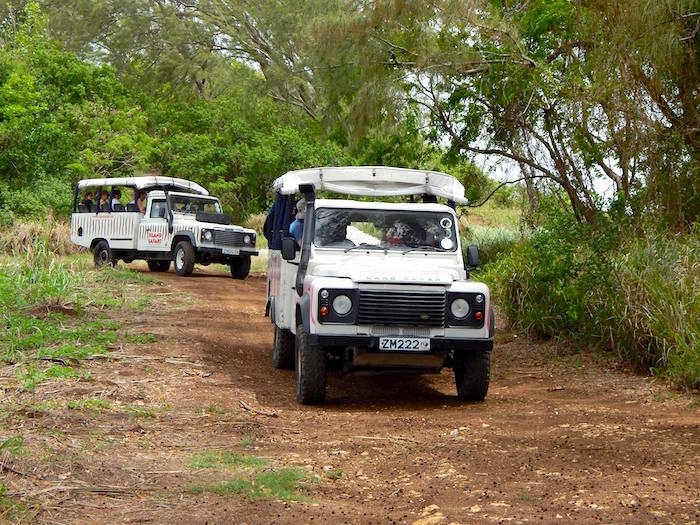 Land & Sea Safari: By Land – You start this tour with the 4×4 Safari exploring our country side and eastern coastline. By Sea – A catamaran takes you to where the rush of cool sea sprays and the flying fish ride the waves. Saturdays only. Includes: Soft drinks, juice and rum punch served on the safari and a sumptuous buffet lunch with wine and an open bar served on the sailing cruise. Go on your own safari. They will tailor make a tour specially for you. Experience the island at your pace, if you are looking for somewhere special just let them know and they can help plan it for you. They can provide food and drinks packages for this. Includes: soft drinks and rum punch or juice along the way. Entrance fees to attractions additional.